Posted on August 25, 2017 at 9:46 pm. This high-resolution image of Juling Crater on Ceres reveals, in exquisite detail, features on the rims and crater floor. The crater is about 1.6 miles (2.5 kilometers) deep and the small mountain, seen left of the center of the crater, is about 0.6 miles (1 kilometers) high. The many features indicative of the flow of material suggest the subsurface is rich in ice. The origin of the small depression seen at the top of the mountain is not fully understood but might have formed as a consequence of a landslide, visible on the northeastern flank. 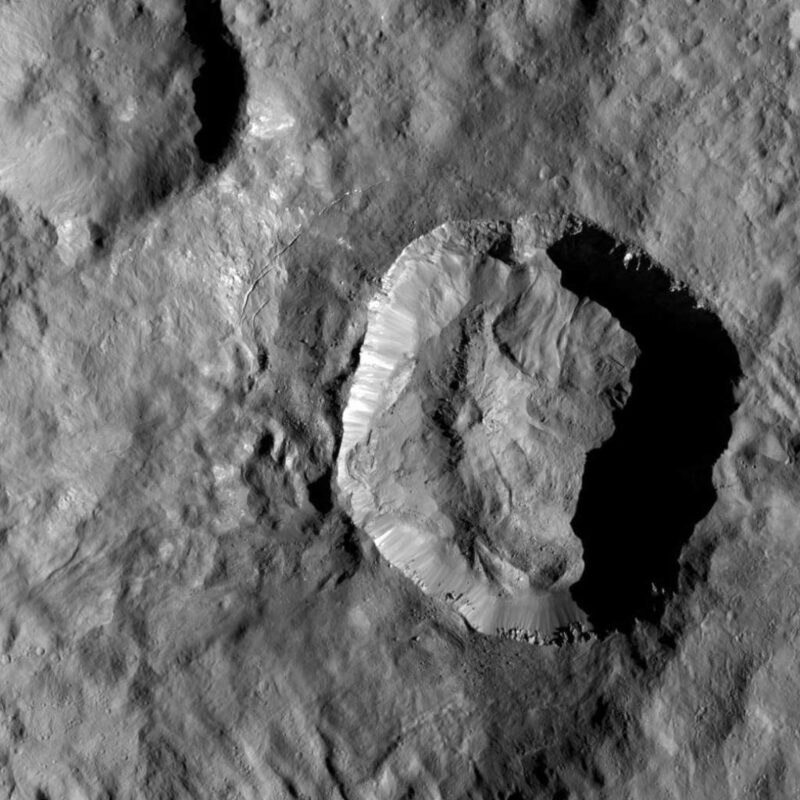 Dawn took this image during its extended mission on August 25, 2016, from its low-altitude mapping orbit at a distance of about 240 miles (385 kilometers) above the surface. The center coordinates of this image are 36 degrees south latitude, 167 degrees east longitude. Juling is named after the Sakai/Orang Asli spirit of the crops from Malaysia. NASA’s Dawn spacecraft acquired this picture on August 24, 2016. The image was taken during Dawn’s extended mission, from its low altitude mapping orbit at about 240 miles (385 kilometers) above the surface. The center coordinates of this image are 38 degrees south latitude, 165 degrees east longitude.